A swimming pool has interesting tiles all around its edge. These are my bright Pool Tiles, block #11 for the City Girl Sew Along. I used 2 Riley Blake Designs fabrics for this block. The dots at the center of the top right and bottom left blocks were fused and machine appliqued using blanket stitch. Trace template (click here to download template) onto the smooth side of the HeatnBond fusible web (for more details about working with fusible web, click here). Press it to the wrong side of the leftover scrap of blue fabric. 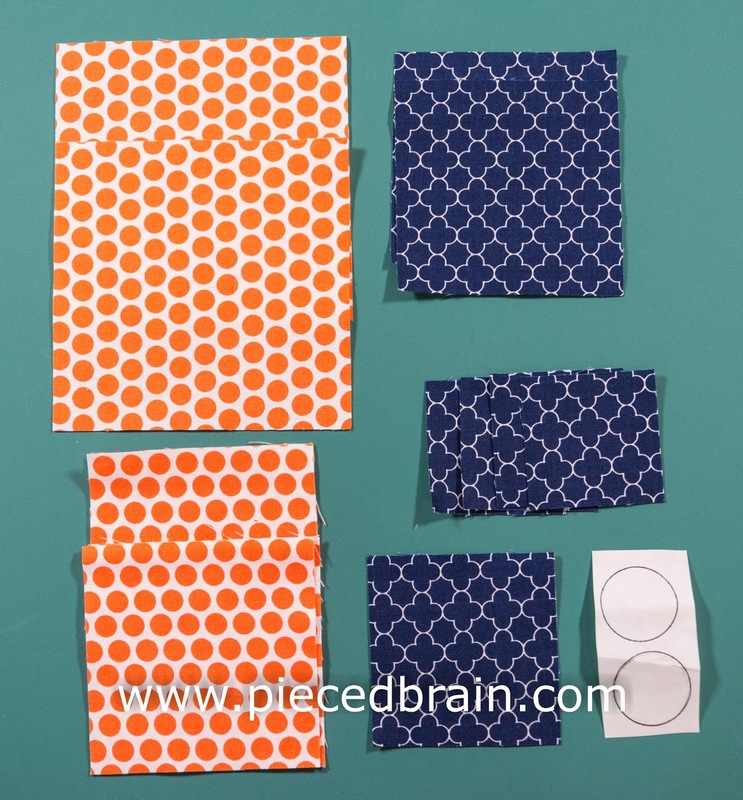 Using sharp scissors, cut the circles, peel fusible web paper, and fuse them onto the center of each 4-1/2" orange square. 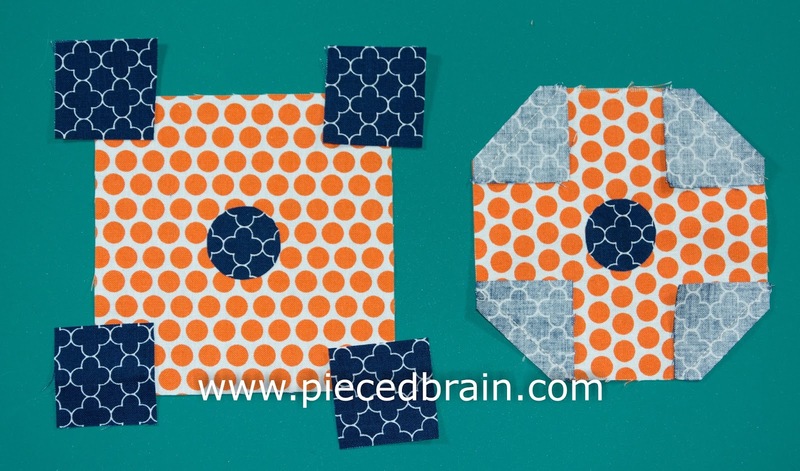 Using the erasable fabric marker, trace a diagonal line on the wrong side of each of the 8 1-1/2" blue squares. Place one of them, RST, on one of the corners of a 4-1/2" orange square. 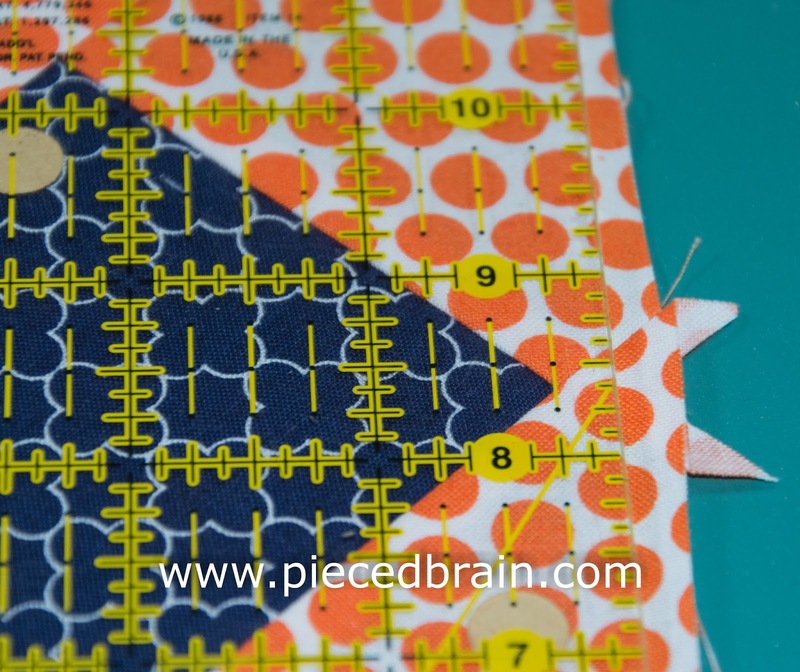 Pin and stitch (I usually stitch a couple of 'threads' to the right of the diagonal line to ensure that, when I flip the blue square, it will extend so the resulting square will still measure 4-1/2". Repeat for the other 3 corners, and the other orange rectangle. Press. This is what your tiles should look like. 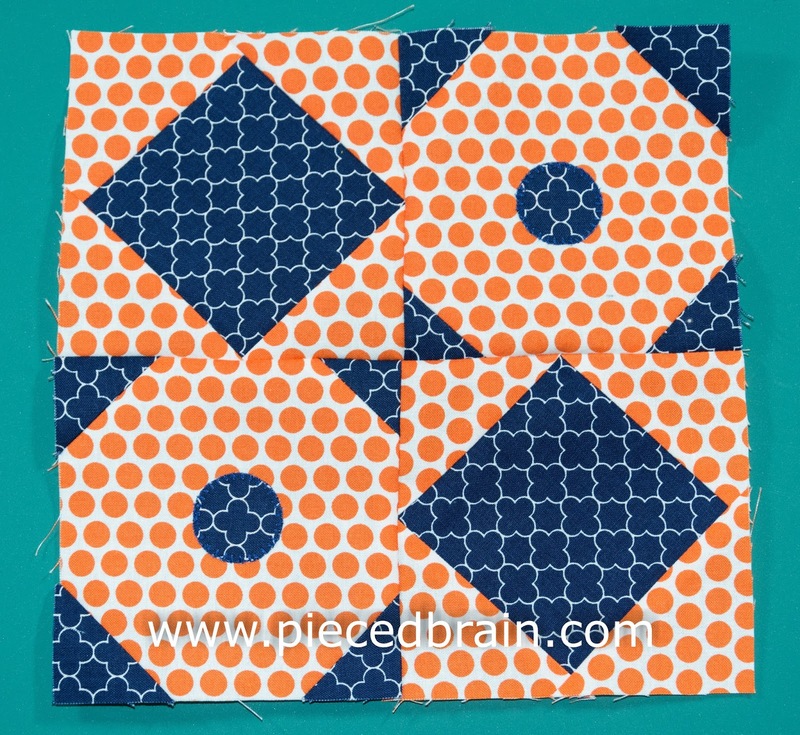 At this point, go ahead and machine applique the circles. 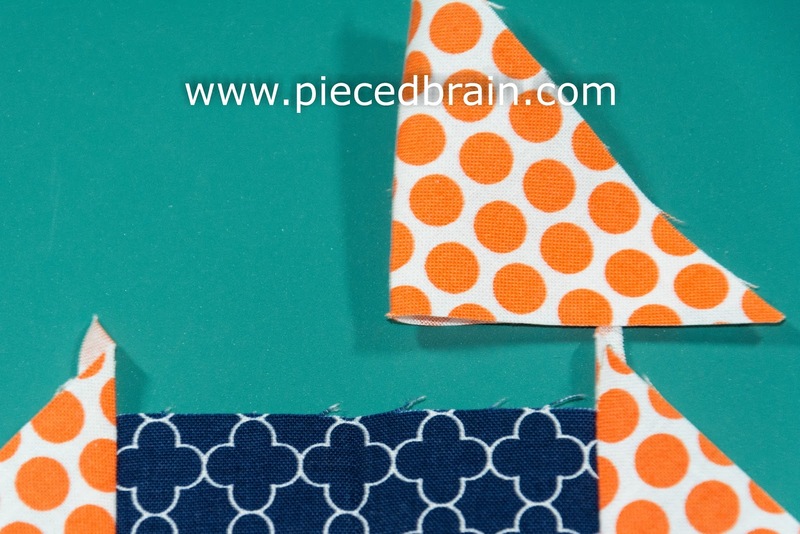 Place one triangle, RST, over a 3-3/8" blue square and stitch them together (I fold the square to find the center of the edge where I am going to stitch the triangle, then I fold the longest side of the triangle to find its center; finally, I match the lines and stitch). 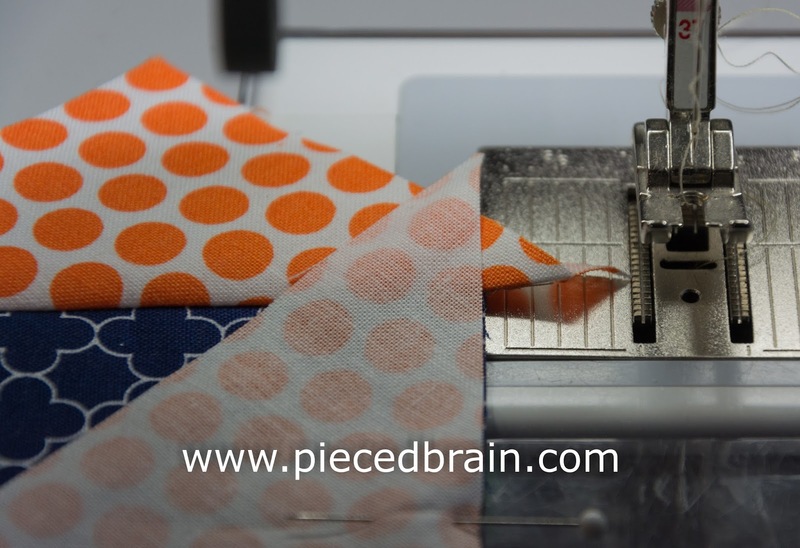 Repeat by stitching another triangle to the opposite side. Press. Repeat the same steps to add the triangles to the remaining sides. Do the same with the other blue square. Press. 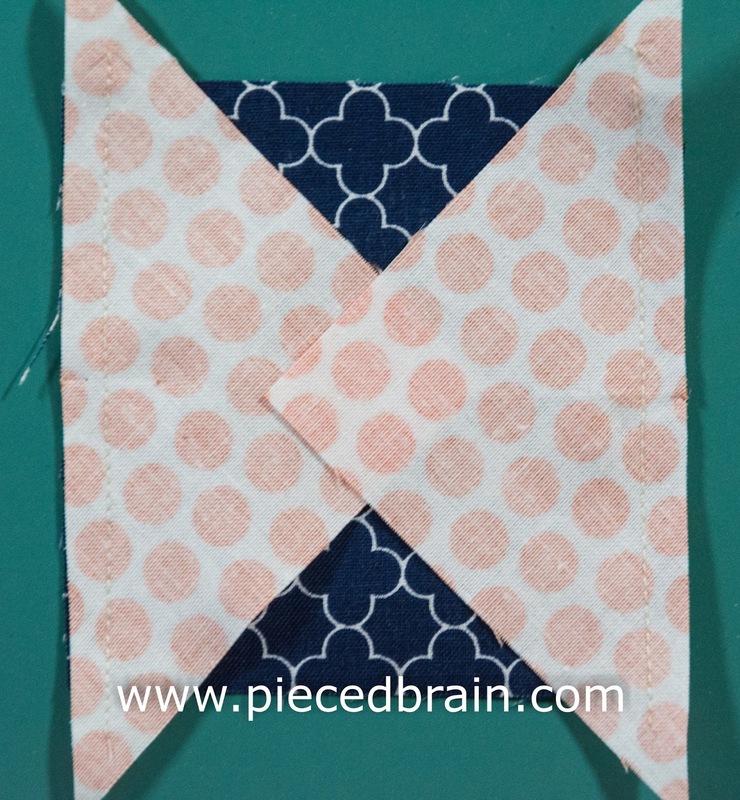 To square this block, place the 1/4" line of your rule flush with the tip of the blue on-point square and trim. Repeat for the other sides and the other block. If you can imagine a few of these blocks in a row, the alternating blue and orange squares would make a nice pool edge. Huhmm... another project for my list! How are your blocks coming along? Send me photos and I will post them here next week. In the meantime, tomorrow I will show you a quilt top which is ready to be quilted. Until then, enjoy the evening. Great block, I love the design and the colors. Thanks for the tutorial!